Discussion in 'Server & Client Support' started by Chris, Sep 5, 2012. Renaissance currently is migrating to a new IRCserver. Our new irc server offers much more improved features versus the former. Install the program using the default settings. 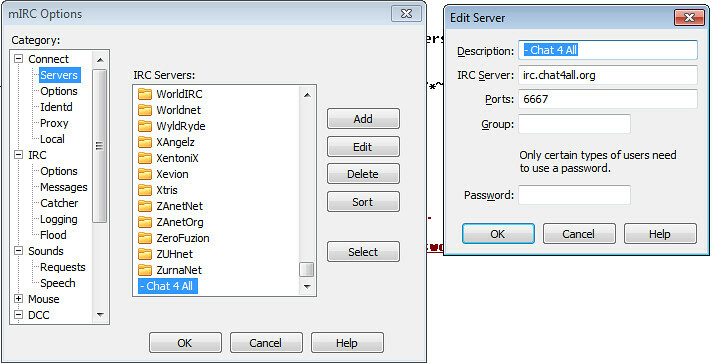 Using the MIRC Menu select File -> Select Server. You will see a list of default servers. Lets add our own. Click the Add button on the right. Enter in the following information to create a connection to the WildIRC Server. Now that the server is created double click on it in the list. This will take you to the connect window. Select your preferred nickname and click the connect button. Note: Once you have configured MIRC you can simple connect by clicking the lightning icon in the upper right. Once you successfully establish a connection to the server you will be presented with a chanel list. Enter Renaissance into the box. Click Join and your ready to go. Note: This will register the current nickname you are using. Note: This will authenticate the current nickname you are using. Note: You must have already opened the channel using the /join #channelname command, and must have operator status. Note: Once registered, Chat4All will automatically mask your IP address to a degree. Note: They must be online and the nickname must match for this to work. 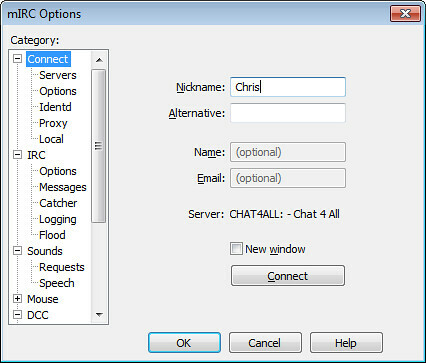 I have my nick registered with chat4all and have my pw setup. When I log in it shows me in a joint channel with #uortrade and #uor when I click uortrade it opens the new channel and looks normal but when I click on uor it doesnt do anything. Ive even tried clicking channels and join channel uor but nothing. I can chat in uortrade no problems. Which program are you using to connect? 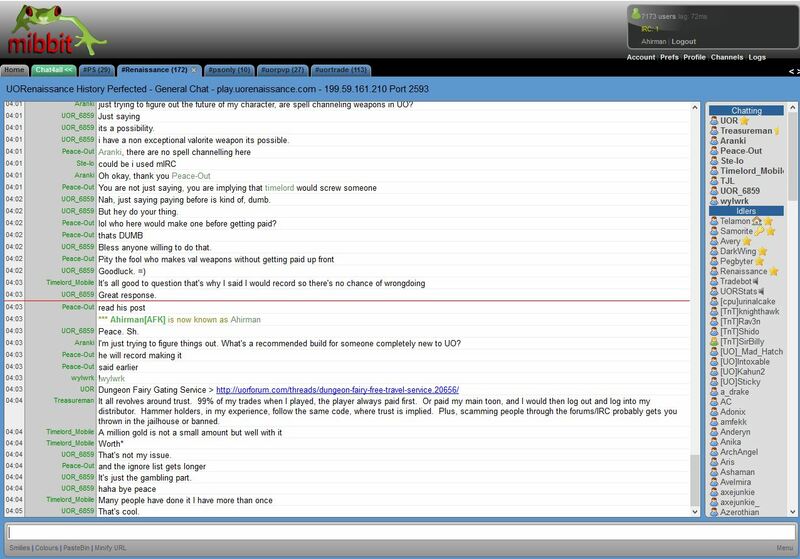 Mirc, Light IRC (web chat) or other? And we are still learning all the tricks with the Chat4All user registration system, however they are very helpful if you have questions in #help. I just click on the web based IRC link on the forum site or main webpage, I will check out the help channel and will post if they know anything. I just logged in and it only shows #uor like it should instead of showing me in two channels. not sure what changed but works fine now. Is there any free IRC client you can recommend ? Did they recently change their policy or am I missing a way of registering free of charge ? You can continue using the program after the trial period ends but yeah still my bad. Did some quick reseach before I bail from work. Thats all I got for now, sorry bud. Cool guys, thanks alot !!! But going through the hassle of online payment to pay 20$ for ancient software doesn't work for me. or you can use mibbit if you don't want to install anything. If you bookmark and register for an account, you can add the UO:R's info the your setting and mibbit will auto connect each time you use it. Thanks AlexCCCP & Ahirman I'll give mibbit a shot. I would double check everything. I'm using it right now. Mirc will let you in for free but you have to wait through a 30 second delay at startup. If port 6667 doesn't work try 6668.